There is or will be sufficient road signage leading to the truck stop, on roundabouts and on major road signs. The stop itself will have clearly marked entrances and exits. On M56, stay in right hand lane sign-posted North Wales. Take exit sign-posted A494 Flint. At roundabout take 4th exit sign-posted A494 Flint and stay in left lane. At next roundabout take 3rd exit on to Second Avenue. Follow road around sharp left hand bend on to Fourth Avenue. North Wales Truck Stop is on the right hand side, next door to Thomas Hardie Volvo. On A55 stay in right hand lane signposted M56. Take exit sign-posted A494 Flint & Deeside Ind. Pk. At roundabout take 2nd exit sign-posted A494 Flint and stay in the left lane. At roundabout take 1st exit and then at next roundabout take the 3rd exit on to Second Avenue. Truck stop and facilities open 24 hours a day, 7 days a week. Stocked vending machines and access to kitchenette facilities etc. out of hours. The truck stop and diner will be closed on Bank Holidays. We will be closed on Christmas Day, Boxing Day and New Years Day. Toilets & Wash Facilities are available via the external provisions after these hours all year except bank holidays. CLICK HERE FOR A SEPARATE GOOGLE MAP THAT YOU CAN ALSO PRINT. Space for up to 100 vehicles. Credit & debit cards and PayPal accepted. Free parking for up to 2 hours in the day. £15.00 overnight parking (dated April 2012) safe and secure with 24 hour security guards. SNAP and major fuel cards accepted. In year two we plan to fit fuel pumps – we will accept fuel cards though at this point we do not know which in particular – we are open to suggestions from patrons. 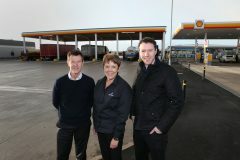 In the meantime there is a 24/7 BP garage located at the entrance of Zone Two on Deeside Industrial Park. We also plan to eventually fit a truck washing facility; in the meantime there may be a provision for drivers to make use of a jet wash or steam cleaner at certain times of day. On site diner serving a range of quality hot and cold food. Showers and toilets – separate male and female facilities. Free computer and Wi-Fi access. 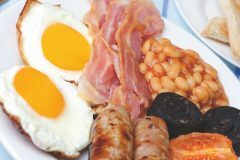 Breakfast menu (including vegetarian options) with variety of full breakfast, sandwich and “on toast” options. Main meals such as steak, fish and chips, pie. Soups and fresh, made to order sandwiches. Baked potatoes with choice of toppings. Daily specials such as lasagna, chili, cottage pie, curry and stews. Everything available to eat in at comfortable diner or to take out. Food served 05.00hrs to 21.00hrs with fully stocked vending machines available outside of these hours. Vending machines offer hot and cold options including sandwiches, sandwiches for toasting, pies, express meals, soups and hot and cold beverages; accessible kitchenette for heating food and drinks. The site is manned twenty four hours a day by security staff. Entire site is ring fenced and entry and exit to site barrier controlled. Flood lighting and CCTV cover the whole site. Dandy’s has been a family run business since 1826 and has always been affiliated with trucks and drivers whatever the core business (currently landscaping and gardening supplies). Since moving to Deeside Industrial Park it became evident to us that North Wales has been seriously lacking in the way of facilities and services for truckers in this part of the country and so the decision was made to do something about it. We have our own fleet of HGVs and we have lorry drivers coming and going day in, day out delivering and collecting stock so we’ve designed our truck stop with these guys in mind; priorities being hot running water, clean showers and toilets, safe and secure parking, decent hot food, free wi-fi access and a TV lounge to make sure that every trucker who decides to visit us has somewhere safe and comfortable to re-charge after a long day on the road. We’re open to suggestions so if anyone has ideas on what services and facilities we should be offering or what food we should have on our diner menu then please let us know! Although we have done extensive research this is still a new venture for us; we are open to suggestions and would welcome advice from any persons willing to give it. We’d love to hear from truckers themselves what they would like to see in a truck stop and on a diner menu.